I get it! Talent Acquisition is finally moving from awkward teen to young adult. It’s time we stop driving the hand-me-down beater and buy our first new car! We don’t want to make a bad choice and buy a lemon, and unfortunately, Consumer’s Report has yet to give us a list of the ATS “Best Buys”. This is one reason I love Ongig’s, and Rob Kelly’s continued research and analysis of the Applicant Tracking market. 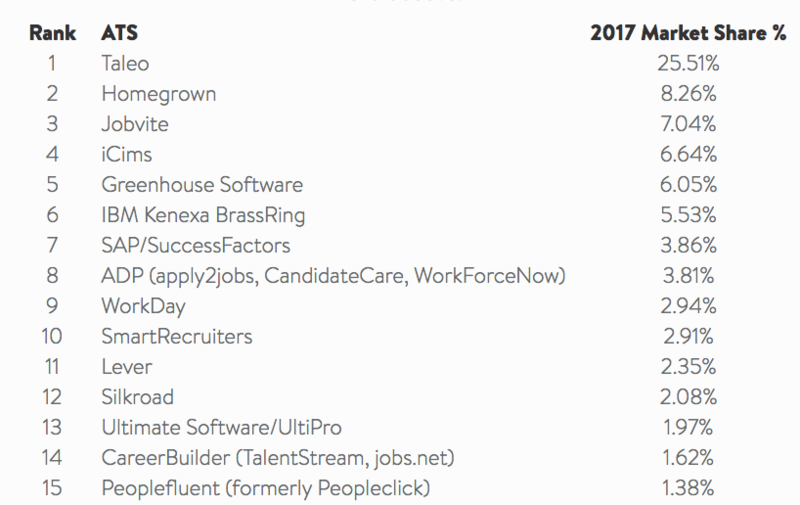 This past week Ongig released their 2017 version of The Top Applicant Tracking Systems Annual Report. I love this report because there’s nothing else like it on the planet! I also like it because the ATS vendors try and tear it apart, which tells me it’s probably fairly accurate! If it wasn’t good, they would make fun it and laugh it off. We see that frequently with these types of reports that are built on bad data, but this report hits them differently, and most find some value out of what it’s saying. I’ll say, that the 2017 report is far in away the best one that Rob and Ongig have put out! The data comes from over 3,000 employers from SMB to Enterprise, so a great sample size. – There are hundreds of ATSs on the market, but Ongig found about 99 ATSs make up almost 100% of the market. “Homegrown” is not the name of an ATS (although you could now get some great SEO if you changed your ATS name to “Homegrown”!) it means a company built their own, or they’re using MS Excel, etc. 249 to 100 (Mid to Large) – Taleo, iCims, and Kenexa are the top three, but #4 you begin to see Jobvite. 99 – 25 (Mid) – Taleo, Jobvite, and Greenhouse. I’ll say if you have under 100 job openings at any one time there is no reason you should be using Taleo! 24-10 (SMB) – Greenhouse, Taleo, Lever and SmartRecruiters. 0-9 (Small) – SmartRecruiters, Greenhouse, Lever. – Fastest Growing ATSs might be a better gauge at what ATSs you should be demoing! Those are (in order): Greenhouse, SmartRecruiters, WorkDay, and Lever. I’ll say WorkDay gets in under ‘fastest’ growing, but only because they convert their HRIS clients over to the recruiting product. – The top ATS market for staffing agencies is: Bullhorn, PC Recruiter, BrightMove, CATS ATS, Crelate, and Compas. The problem here is most are built for direct-hire staffing and not contingent staffing which is growing fast and will continue. The contingent market is different in that they need an ATS that also flows into a pay-bill backend which no one has figured out well how to have great ATS technology and solid backend pay-bill. – Tons of organizations every year which from one ATS to another. You see companies going from Taleo to Workday, iCims to Taleo, Taleo to iCims, Jobvite to Greenhouse, etc. What I find in most of these situations is the leader who implemented the original system has left and the new leader wants something they’re familiar with or just something ‘new’. Rarely are they actually upgrading to an ATS that is noticeably better.